Perfect competition, calculating marignal cost and equilibrium - FreeEconHelp.com, Learning Economics... Solved! This post is a question an answer for the economics of a perfectly competitive firm. c) what is the equilibrium price in this market? For the above example, change in quantity is always one, so we can find the marginal cost by only looking at the change in total cost. The marginal cost of the first unit, is 1 (101-100). The marginal cost of the second unit is 2 (103-101). 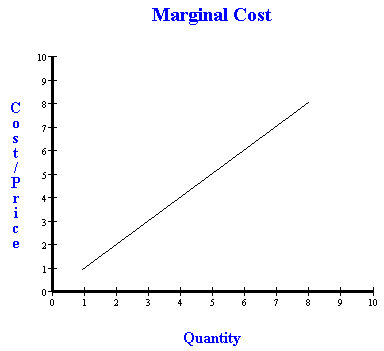 The marginal cost of the third unit is 3 (106-103), and so on until we have calculated all of the marginal costs. The fixed cost is always going to be equal to 100, and we know that it is 100 because the total cost is 100 even when we are not producing anything (remember that fixed costs are costs occurred regardless of the amount being produced, even if that quantity is zero). 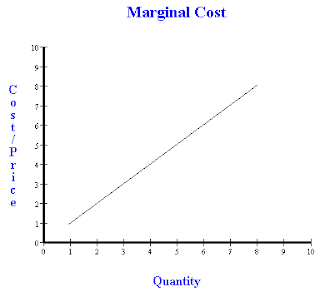 Drawing the marginal cost curve requires us to match up the numbers in the marginal cost column with those in the quantity column. Because of the nature of this particular firm’s MC, we get a 45 degree line starting at a quantity of 1. The market supply curve is the horizontal sum of each individual firm’s supply curve. So the market’s supply curve will still begin at a price of 1 (because of the marginal cost of 1) and end at a price of 8, but now the total quantity supplied will be multiplied by the number of firms in the market. For example, if there are 10 firms, the quantity supplied at a price of 5 will be 50 (10*5), but if there are 15 firms, the quantity supplied would be 75 (15*5). For the graph below, I have assumed that there are 100 firms in the market. Finally, what is the equilibrium price in this market? 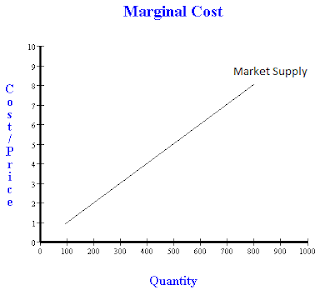 Normally we try to intersect supply and demand, but we can also back out the long run equilibrium price by figuring out where marginal cost and average total cost intersect. This will be our long run equilibrium, because at this point there is no economic profit by the perfectly competitive firms. Looking back at our table above, we can add in other column for average total cost, which we can figure out by dividing total cost by quantity. So obviously this method didn’t work, there must be more information available that I am missing, feel free to comment in this additional information and I will finish the problem!